Ever since I can remember, my mother has been my biggest supporter, cheerleader and positive influence. However, within recent years she’s added a new role to her resume, as my personal financial coach! From a young age, she’s always encouraged my younger brother and I to be financially responsible, with a heavy emphasis on saving. Her advice comes from years of experience and to this day she’s never steered me wrong. When I began my career a year ago, she was of course very vocal with her advice about my finances. Though most people would be anxiously anticipating what they’re going to buy with their first check, my mom and I were sitting down planning out my finances down to the last cent. Right away, my mom insisted that by my second check, I needed to have a 403(b) (401(k) if you work for a for-profit company) set up and be saving for my retirement. Of course I’m thinking, retirement?….I just started working. However, I trust my mom’s judgement over anyone and I understood that starting my retirement savings immediately would only benefit me more in the end. My purpose of moving home after graduating from college was so that I could build my personal savings before going out completely on my own forever. So with my mother’s insistence, I began putting the equivalent of one entire biweekly check into my savings every single month. Having those savings actually made it possible for me to put a nice down payment on the car of my dreams back in August! I don’t know where I’d be without my mother’s amazing financial advice. I honestly believe that these tools are the very reason I've become the thrifty girl that I am today. That’s exactly why I couldn’t be more excited to further broaden my financial literacy knowledge at the #PUSHMoneyMatters workshop on December 5th! 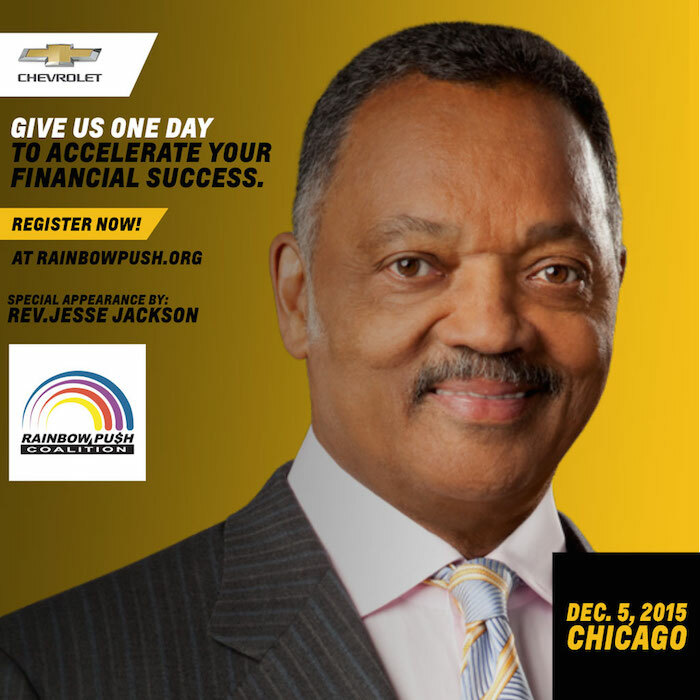 Rainbow PUSH and Chevrolet have joined forces to provide a free one-day workshop that is sure to inform and empower everyone towards financial success. You can join me and your fellow millennials on the 5th to learn more about credit, investing, budgeting basics and investing. What’s better than free information that actually has the ability to benefit you financially? Register for the upcoming workshop by clicking HERE. What’s one thing about finances that you look forward to learning more about? Great post! I'm excited for this event as well; see you there. It was so awesome seeing you at the event. We definitely learned a lot!